Friendship Community Church, Fort Myers, Fla., streams their worship services in real time using this equipment. Pastor Rich Schnieders (right) makes a final check before services begin. The room which holds the equipment for broadcasting the services live over the Internet is at the right. 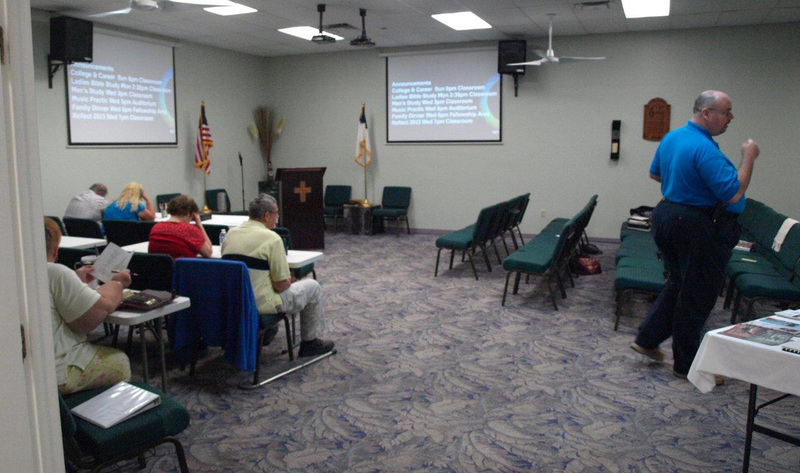 At Friendship Community Church, a Grace Brethren congregation in Fort Myers, Fla., members who are physically unable to attend services on Sunday are still able to participate through innovative use of live video streams via the internet, according to Pastor Rich Schnieders. According to Schnieders, the church had previously offered audio of their services on their website, but this did not allow the sick or injured to actively take part in services. 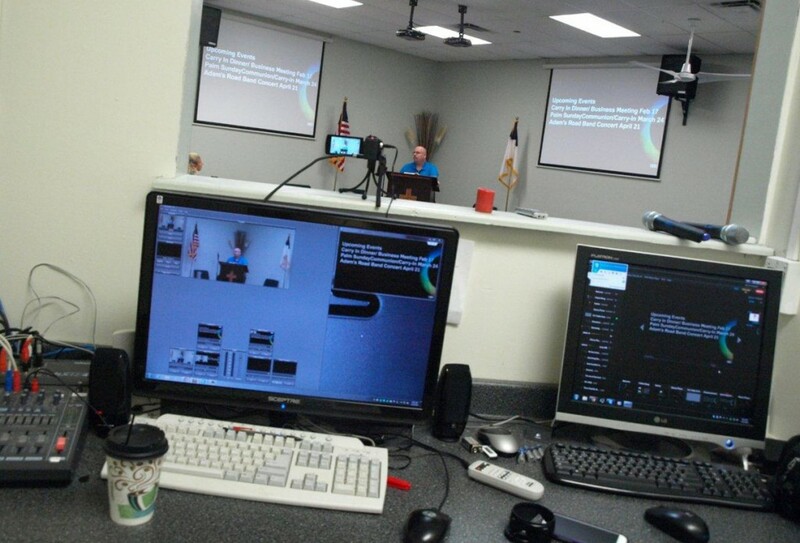 Money was tight at FCC, but church leadership was convinced a live video stream was a ministry they were to pursue. To access the live feed, click here. The church began the ministry with a borrowed camcorder and limited computer resources, but MediaServe, the church’s Christian web hosting provider, set up a system to allow anyone using a computer, tablet, or smart phone with internet access to watch live broadcasts of services. Aside from services, the church has also streamed weddings for family members who were not able to attend, as well as concerts. According to Schnieders, the church plans to add more cameras to their broadcasting setup to allow operators varying views of the services, rather than a static view of the pulpit. “For a modest investment of money and the time of the video/sound crew FCC is able to bring our services to more people, allow those unable to attend services due to illness, injury or distance the ability to still fellowship and worship with the rest of the congregation,” Schnieder said.